« “Spirit Werewolf Stabbing” like “Kacking? Not the legendary, Hollywood kind. Mark S. only told his wife and son, Joe. 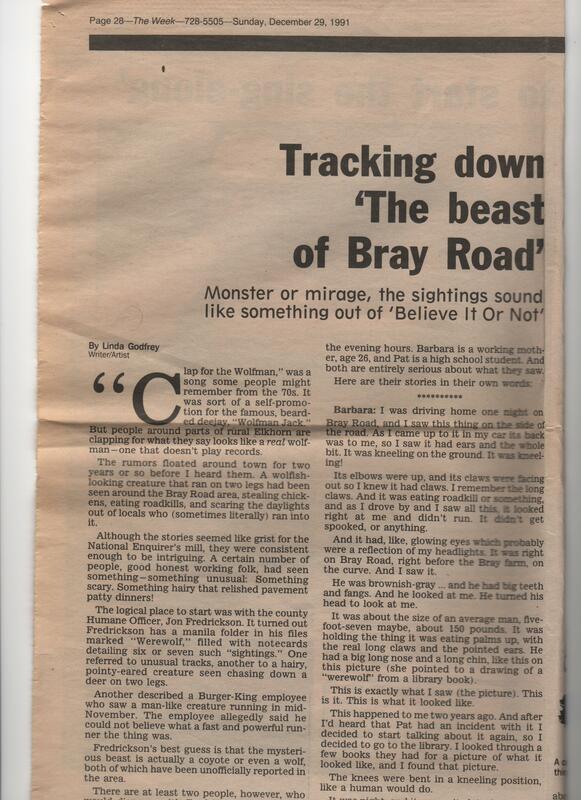 Joe told me after he saw stories about the Beast of Bray Road on TV and wondered if they were the same thing. Did you ever hear a reason from anyone why Mark Schackelman, Jefferson Wi 1936 told his story? Well, I am consoled by the first book now on kindle … so I can have it with me anywhere! …and signed them too! I’m in the book business, (Dark Hollow Books at abebooks), books signed by the author are always more valuable. Thanks Bill! I only wish I had known prices would go that way so I could have hoarded a few copies! Pricey is right Linda! I just checked abebooks and the 2 copies listed are $59 and $64 – large trade paperbacks. Naturally I have a pristine copy that I will never part with (along with HUNTING THE AMERICAN WEREWOLF and MICHIGAN DOGMAN). Can’t wait for REAL WOLFMEN. Keep on investigating and writing for another 20 years Linda!! Happy anniversary! Congrats! Let’s PARTY!!! I would love to accompany you Linda! I’ve been researching and obsessing about this creature since I heard about.